Webmention is a W3C Recommendation that supersedes Pingback, using only HTTP and x-www-form-urlencoded content rather than XML-RPC, with additional functionality (e.g. updates & deletes) as well as greater security & robustness from years of experience with prior iterations. https://webmention.rocks/ - Webmention test suite! Then: Submit an implementation report for Webmention to help document the growing interoperable decentralized webmention network! Alice's publishing software verifies that Bob's post actually contains a link to her post and then includes information about Bob's post on her site, for example, displaying it as a comment. Aaron's server displays the information about Barnaby's post somewhere on Aaron's post. If a u-url is present at the source, then the receiver could display that URL, and default to showing the source otherwise. This allows services like Bridgy to render the original tweet URL in the u-url property so receivers will link to the tweet instead of the Bridgy proxy page. 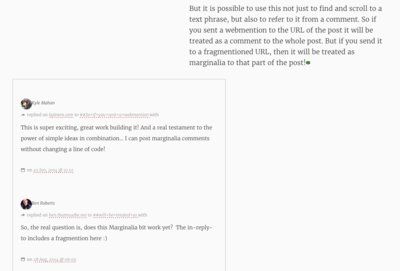 See comment: how to accept a comment for more details on accepting comments in general and displaying them. 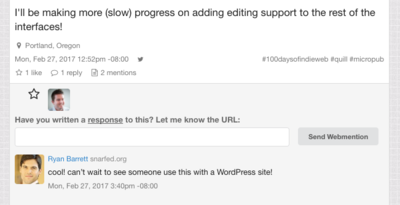 validate and process received Webmentions for what type it is (like a reply, like, repost, or other response), and whether it is new, an update, or a notification of deletion. Manually sending a webmention with cURL can be the quickest way for developers to test webmentions. The following users/sites have live implementations for sending and or receiving webmentions, listed in rough chronological order of when they did so. For past implementations that are no longer live, see Previous Examples. If you add Webmention sending or receiving to your site, add yourself in a new section at the bottom of this list and link to your site, implementation(s), and permalinks of your webmention receiving/sending posts. Try to include a screenshot that shows that too. All posts send webmentions (as of 2013-05-26 first (semi-)automatic webmention sent on 2013-03-31) upon posting (asynchronously with posting UI, no results reported). All(?) posts send webmentions as of 2013-05-31 and accept as of 2013-06-?? Discovery only with HTTP Link: <http://waterpigs.co.uk/mentions/webmention/>; rel="http://webmention.org/"
Posts have a hyperlink in footer "How to comment on this post" to instructions detailing posting an h-entry with h-card and how to send a webmention. Discovery only with HTTP Link: <http://cweiske.de/stapibas/xmlrpc.php>; rel="webmention"
check self Atom feed, if there are updates then proceed with discovery/sending for each update, for each link in the update: do a HEAD request first, do discovery for webmention endpoint, if none found, do discovery for pingback endpoint, if none found and the resource is 'application/xhtml+xml' or 'text/html', do a GET request, do discovery for webmention endpoint, if none found, do discovery for pingback endpoint. send webmention if an endpoint was found, otherwise send pingback if an endpoint was found. Bear on bear.im as of 2013-12-01. Webmentions are sent manually for all posts. gRegor Morrill sending and receiving webmentions on gRegorLove.com as of 2014-02-04. Incoming webmentions validate the target is a valid URL on gregorlove.com and the post ID in the URL is valid. Webmentions are parsed and further validated asynchronously. 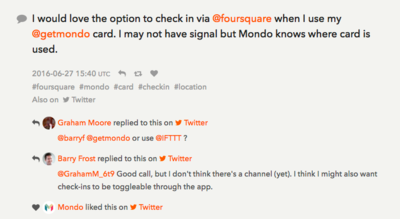 Replies/mentions are displayed interleaved with "local" blog comments.. Yet to implement: full authorship parsing, updates, deletes. David Shanske supports sending and receiving webmentions for all posts using WordPress on david.shanske.com as of 2014-03-?. 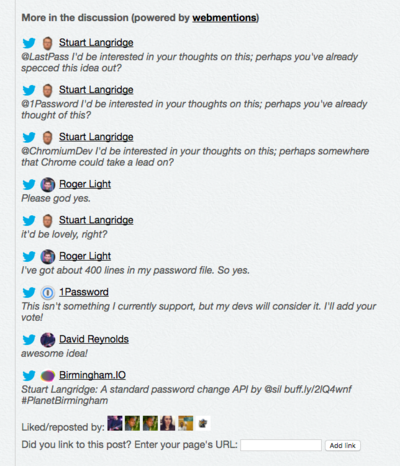 Parsing replies, mentions, and likes. Rsvps are handled as just mentions currently. Currently uses vouch and a whitelist while all others are sent to moderation. Processing happens asynchronously by cron job. Submissions return a link for queue record that returns a status as a Webmention-Status header as well as a minor note in the body. Sending is done automatically when post is made. 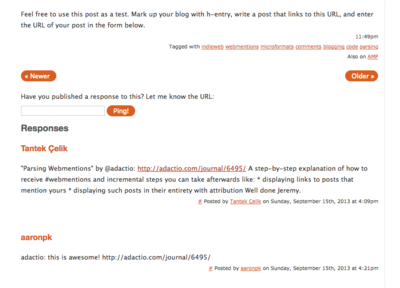 Joel Dueck receiving webmentions on thelocalyarn.com as of 2014-09-23. 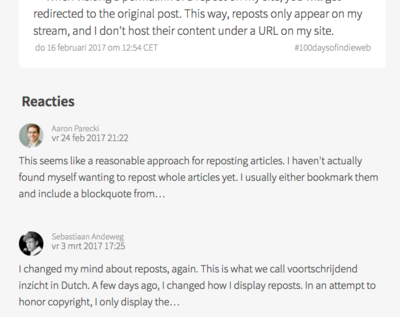 All posts accept webmentions as well as traditional comments. Webmentions (if valid) are logged to a text file and sent to Joel via email. Those that pass moderation are manually added to the target post as a comment (which on this site means it is included in the blog and sent to email and RSS subscribers as well as being appended to the target post). Endpoint is a modified version of Jeremy Keith's webmention.php. Webmentions sent manully. More to implement. To-do list is long. Site is running Textpattern CMS, so a complete webmentions plugin is both feasible and ideal. Dan Lyke receiving webmentions on Flutterby.com blog entries as of 2014-10-10. Webmention endpoint is broadcast via <link> element and <indie-action> element. 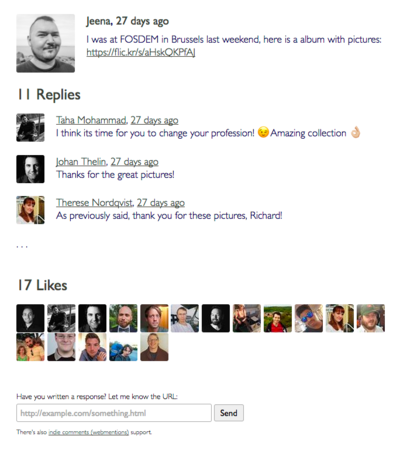 Johnny Oskarsson receiving webmentions on joskar.se as of 2014-10-23. Webmention endpoint is broadcast via Link: HTTP header only. Webmentions are sent manually for now. Write up linking to various bits of code for Pelican, the Python static site generator, at "Enabling Webmentions". Webmention endpoint is declared in the HTML with a <link> element, because HTTP headers are a pain in the behind to set up by comparison. Uses Pelle Wessman's webmention Heroku endpoint as endpoint, and then some Python to fetch and bake in webmentions on site regeneration, and some JS to pull them in live. Giovanni T. Parra receiving webmentions on fiatjaf.alhur.es as of 2015-02-28. Wrote Jekmentions, a small service that works as a webmention endpoint for Jekyll sites hosted on GitHub that sends the webmentions received as files in commits to the GitHub repository. Webmentions are sent manually for now. Some are being sent, but only through brid.gy to twitter. All posts, links, and photos automatically accept webmentions. Replies, shares, and likes are reverse syndicated via Bridgy. Post, link, and photo permalink pages have an input form for pasting in your comment URL to manually send a web mention. Discovery with: Link: <https://sixtwothree.org/webmentions>; rel="webmention" HTTP header and <link rel="webmention" href="https://sixtwothree.org/webmentions"> in the HTML's <head>. Webmention source URLs are parsed using the microformats2 Ruby gem. j4y_funabashi on j4y.co as of 2016-06-13.
ckruse/webmentions-elixir - Elixir client library for discovering and sending webmentions. and get_rel_webmention (in same library) - PHP get_rel_webmention($url) - calls aforementioned functions to obtain first webmention (if any) and pingback (if any) endpoints. then the next simplest/easiest but still useful, etc. Provide inspirational screenshots / diagrams of Webmention potential, e.g.